In Deuteronomy and other places, the Bible talks about the sins of the Father being passed down to future generations. Well, moral issues aside, I can see how a father’s financial transgressions can hinder the prosperity of future generations. But did you know that in probate court the financial sins of a son or daughter can impact the inheritance of their brothers or sisters? When real estate is sold, part of the job of title company is to check for judgments against the seller. Before a home can be sold, any such judgment must be paid. They can be paid prior to settlement or paid from the proceeds at settlement but they must be paid before the buyer can get clear title and thus title insurance. Why? Judgments, whether technically filed against a home or not, are liens against the property. Even after the sale the creditor can make a claim. Now, when a person dies and there is real estate involved, the title company will check to see if there are any judgments against the deceased AND all heirs. At the time of death, even though title has not transferred, all heirs have an interest in the property and are technically owners. So any judgments against the heirs are a lien against the property. Henry was an upstanding citizen paying all of his debts on time. His sister Elsie was also responsible but due to medical issues and a job loss, she lost her home and has a $100,000 default judgment against her from the lender on her old home. Henry and Elsie’s Mom passed away 10 years ago and recently their Dad passed leaving a house to both of them with directions in his will to sell it and split the proceeds. After paying off the Dad’s mortgage, there was $12o,000 to be split. It looked like each sibling would get $60,000. But since the $100,000 judgment against Elsie was on record, that needed to be satisfied, leaving only $20,000 to be disbursed to Henry and Elsie. Now, while this scenario can really happen, reality is that there will be negotiations with Elsie’s creditor and there may be legal maneuverings that change the outcome. However, these take time and often the parties don’t arrive at the final answer until there is a contract for the home and everyone knows the numbers. Will settlement be delayed? Will the buyer wait? Or what if Elsie owed $200,000 to her lender and the proceeds were only $120,000? The home could not be sold until a compromise is reached and buyers either a) get scared and walk or b) want a huge price reduction for the inconvenience and risk. After the homeowner dies, it is too late to do anything but prior to their death there are steps that can be taken. If there is open communication between Dad, Henry and Elsie about Elsie’s financial predicament, Dad can revise his will to create a clear path for the house to be sold. If the will is revised so that Henry is the only heir, Elsie’s judgment is no longer in play. All proceeds will go to Henry. How Henry handles things from there is between Henry, his conscience and his sister but the house can be sold. I know these situations exist. I have seen children specifically excluded from wills because of judgments against them. But I am not an attorney so do not take action simply because of this blog. Do talk to an attorney about your situation. Your situation may have twists and turns that require strategies not discussed here. Your state law may be different. The point of this blog is to bring this issue to light. If you know you are a heir along with someone who has judgments against them, talk to an attorney now before the homeowner passes. 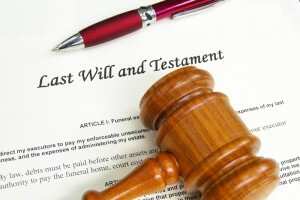 Do not revise a will or take any other action because of this blog. Call an attorney first. Okay, that said, my last point….. I do quite a bit of probate work. Having a loved one pass is stress enough. You don’t need to have surprises pop up when you think you have the house sold. Before we put the property on the market, I will have a title search run at no cost to you to ensure we have no surprises including known judgments against the heirs. There are other things that can crop up in a probate case as well – more mortgages on the property than the heirs know about, unreleased trusts, missing death certificates, etc. If we know these issues in advance, we can usually find a work around. The worst scenario is to get a home under contract, have the title work run and then find out there is an issue. You can’t risk a probate sale with just any Realtor. You need a Realtor experienced in this niche. That person is me.